We are so tickled today to be introducing Vintage Treasures. Today, you’ll find a collection chalked full of classics!! As always, there is a rectangle, oval, square and circle that will work well with everything in your stash and are perfect for layering. 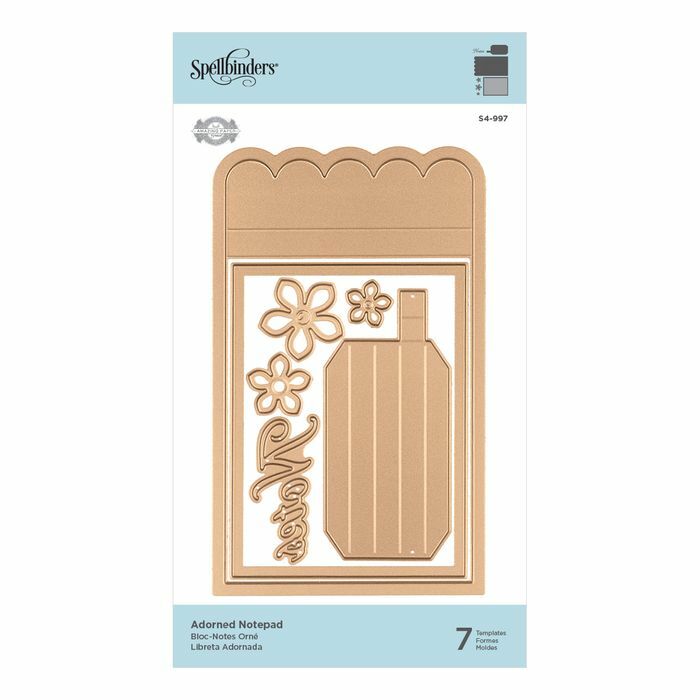 Next, are several embellishment sets. As you hop through all the links in the blog hop, you’ll see all the new dies and how we used them. Every collection starts somewhere a memory, something seen or something felt. For this one, I looked no further than my grandmothers hope chest. There is a special place in our hearts for those things kept in a hope chest. Other than a promise of the future, they symbolize things of value and keepsakes that bring back treasured memories. I delved there to find memories, filigree jewelry and keepsakes of old. 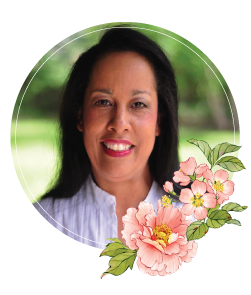 From long-forgotten turn of the century jewelry to the edgings on an old tattered handkerchief, I love bringing the past into the present in a style that is ….well, timeless. These things — bejeweled lockets, a sweet tiara and vintage adornments from long ago — provided the sweet inspiration and restoration of some lovely, lovely Vintage Treasures. The physical dies in this collection have an extra measure of flexibility and function. Most templates have an outer rim, and inlay and an inner rim that you can use for your sentiment. This is a fun offering from the collection. 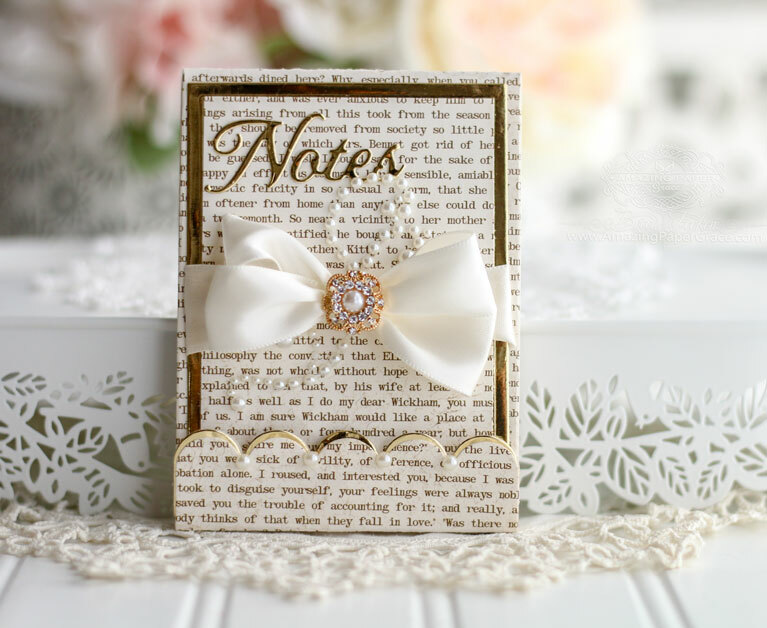 Because the collection is full of rims, labels, and snippets of pretty, I thought the adorned notepad to be a lovely place to showcase those snippets. It creates the perfect little gift for giving. 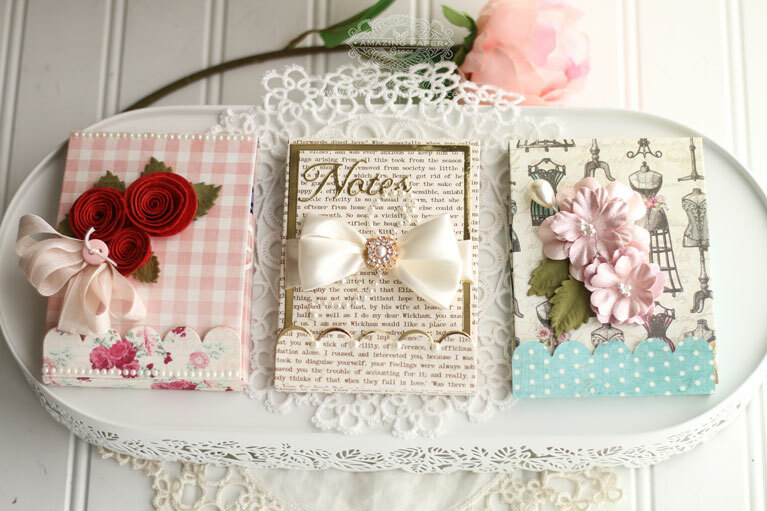 I’ve made a series of little notebooks – one elegant gift notepad (gold and cream), one whimsical gift crayon holder for a youth and one feminine gift notepad for a friend (blue with dressforms). My mind went crazy thinking up uses . . . a coupon book, a sewing kit, a holder for little button cards and tick, tick, tick, it’s still working away at the ideas! Two of the notebooks below have small writing pads in them. I simply went to Office Depot and purchased small legal pads and had them chop the stack in half. After chopping in half, I asked them to trim the bottom also to get to the dimensions I needed. 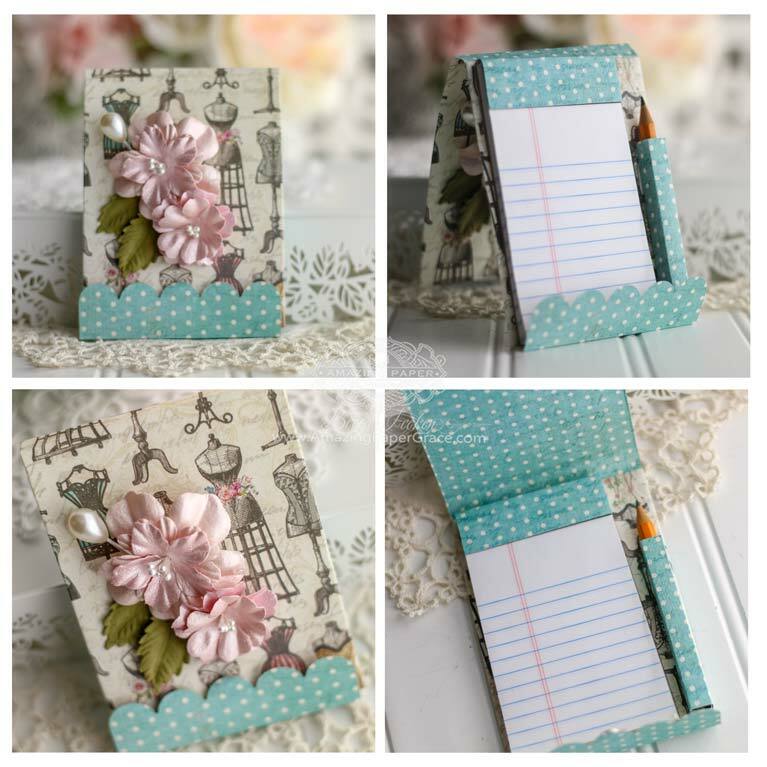 These are 2-1/2″ x 4-1/2″ and they are perfect to tuck into a purse! 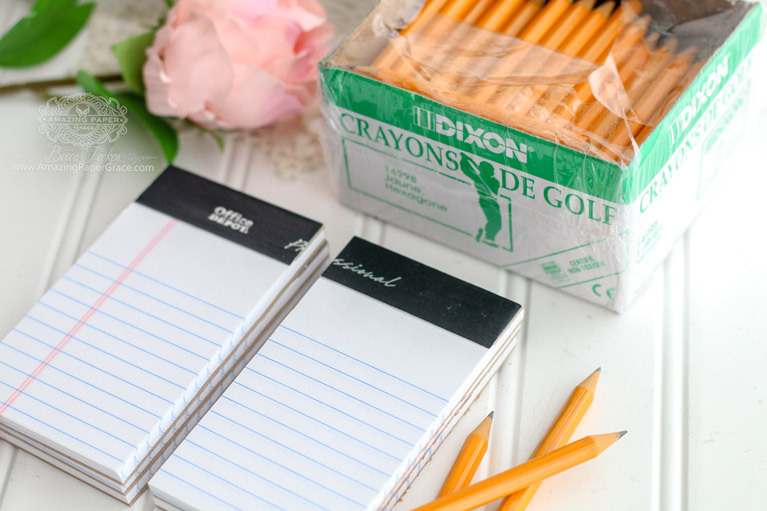 These are supplies that will come in handy with this notepad die – legal pads and golf pencils. I purchased both items at Office Depot. 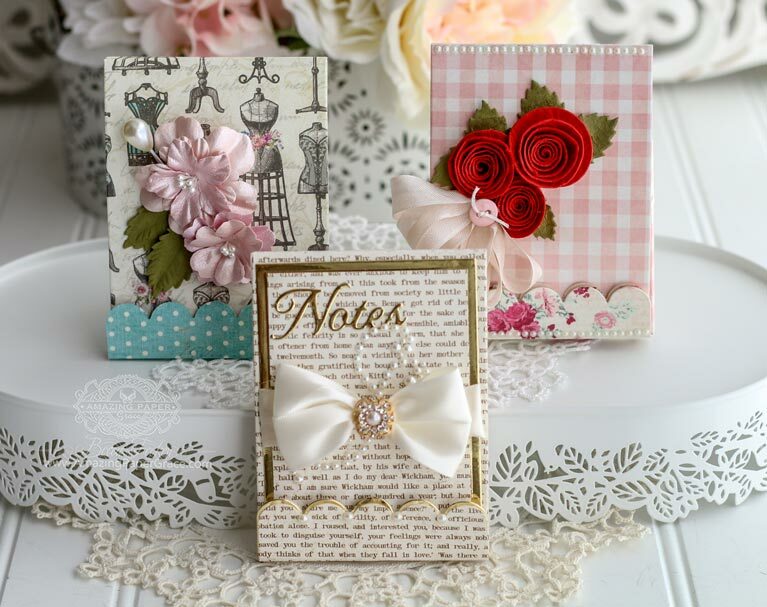 Be sure you leave a comment on this post and every Creative Team Members post for a chance to win an Amazing Paper Grace Die from any previous collection. There are two dies that are being given away. One name will be randomly picked from comments left on the combination of our seven blogs on the Introducing The Vintage Treasures post between April 10 and April 15, 2018, at midnight US Central Time. We encourage all of our international friends to participate! 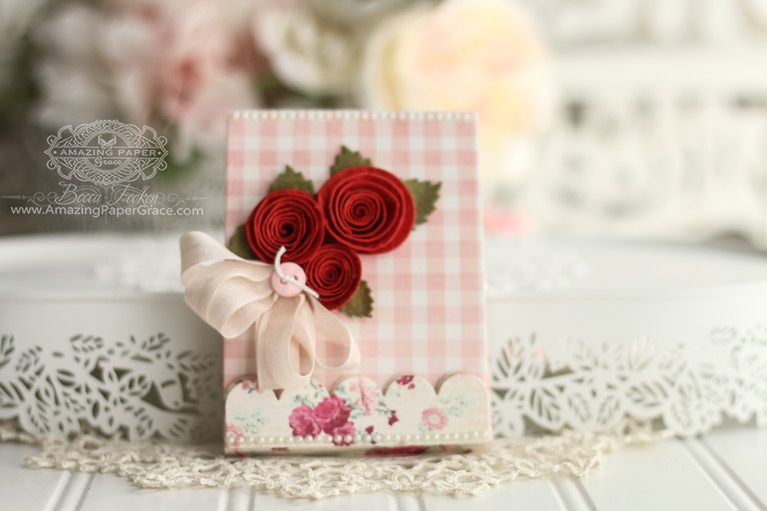 The randomly selected names will be announced on the Amazing Paper Grace Blog on April 16th. (All giveaways for this hop are managed by and the responsibility of Amazing Paper Grace). Up for grabs is an Amazing Paper Grace die of your choice from the Vintage Elegance Collection, the Graceful Borders Collection, the Venise Lace Collection, the Chantilly Paper Lace Collection, the 3D Vignettes Collection, the Romancing the Swirl Collection, the A Charming Christmas Collection, the Glorious Glimmer Collection, or the Shadowbox Vignettes Collection and The Gilded Age. There will be a total of two dies and a winner can win once among all the blogs. If your name is selected, simply claim it within 2 weeks of the announcement by sending your address through the form under the Contact Tab on the Amazing Paper Grace Blog. There won’t be a reply back but if you leave your choice, we’ll get it, I promise. When sent, you will get an email that your die is on the way. The dies will be mailed out from Amazing Paper Grace. 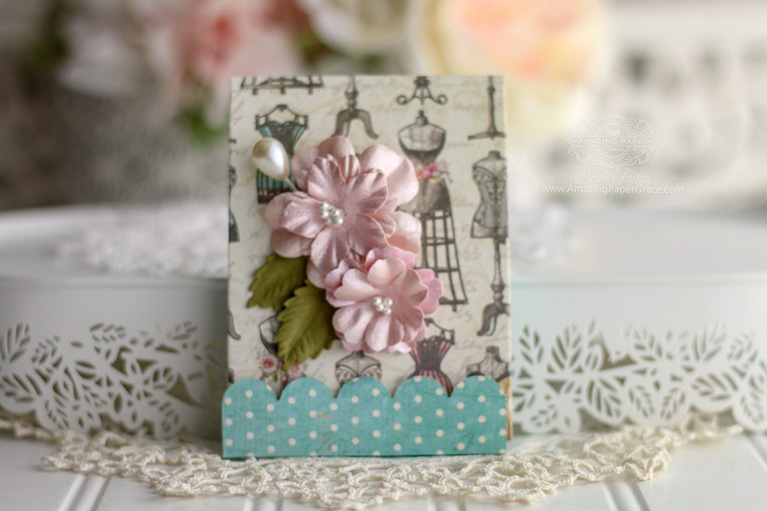 Thanks so much for joining us for the Introducing Vintage Treasures Blog Hop. Is it time to update your dies with new classics? We hope you’ll find some inspiration here that you turn your next project into something you love. Good morning Becca , gorgeous, gorgeous, gorgeous. My heads whizzing with ideas!!! Every season, every event it’s definitely a winner? Have a good one! ! ! Just when I say “I am not going to buy any more dies, you come out with a new collection that I simply can’t resist!! What am I going to co with you girlfriend?? This is such a basic set I know I will be buying it. All of your team has done an outstanding job with them. Waiting on my die of the month to come for April!! Hope all is going well for you! Since I’m blessed with quite a collection of dies, I really appreciate your thoughtfulness in considering how new dies will be used with others in our stash. Dies that help us create something useful are particularly inspiring. It’s so delightful to witness your creative mind at play! Wow! How fantastic are these?! I can see so many ideas – my mind is buzzing! You never cease to amaze me with your wonderful dies and project ideas, Becca. Just wonderful! Hi Becca, Amazing Grace is the correct name for your blog, your work is amazing and you are a very graceful lady. Thanks for all your inspiration.